This recipe came from one of my husband’s patients. She brought several loaves into our office over the years. The first time I had a piece I knew I wanted to get the recipe. It reminds me of something that my grandmother would have made. It just a basic old fashioned type recipe. It is simple with simple ingredients and basic instructions. This patient passed away several years ago. She was the sweetest lady and I am so glad that I have the recipe to remember her by. 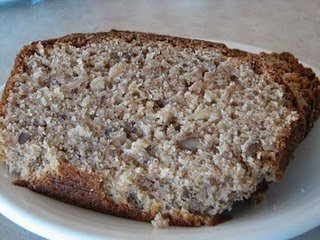 The recipe calls this a cake but it is more like a quick bread or dessert bread. I call it Raw Apple Bread. It is called raw apple because it has chunks of apples instead of applesauce. I hope you enjoy it. I am writing the directions just like I received them. This is how I make it and it turns out great. I used 1 cup of whole wheat when I made it last week and it turned out really well. yum! never thought to put pineapple into the apple bread before! This one I will have to try!!!! Thanks for posting and showing it. Great recipe, like previous post said I never thought to put crushed pineapple. Sounds yummy. my mom makes something like this and the pineapple is the key! THis sounds scrumptious!! Thank you for sharing! Lynn, I am always excited to see what you will post. I know it will be something GREAT! I was not disappointed. I vote for the apple bread. MMM! I make one very similar but usually make muffins instead of the loaf. Hi Lynn. What size is the flat can of crushed pineapple ? A small 8 oz ? I have some apples to use up today and I would like to make the recipe. I think that is correct. I do not have a can in my pantry right now, so I could not check, but I believe it is about the 8 ounce size.